Be careful what you wish for... In theory, the hybrid power units introduced to Formula 1 in 2014 would be the catalyst for returning it to a position of technological relevance it hadn’t enjoyed since a brief (then banned...) era of ABS, traction control and active suspension in the early 1990s. Cutting-edge energy-recovery systems with real-world applications, developed at the speed of F1. What wasn’t to like? and latecomer Honda, has left F1 in a state of flux and turmoil. The most dominant team of the last decade, Red Bull Racing, is – somewhat petulantly – contemplating its future in the sport (ABOVE RIGHT, RBR team principal Christian Horner’s 2015 default pose), having grown weary of the shortcomings of power-partner Renault, while McLaren’s legacy is eroded every time Honda’s radical, but currently woeful “BB gun” fires up. Check out Mark Hughes’ fine critique on why Mercedes-Benz got it so right as the others floundered, starting page 20. We’re not members of the “everything about hybrid power units is terrible” club (founder: Bernie Ecclestone). 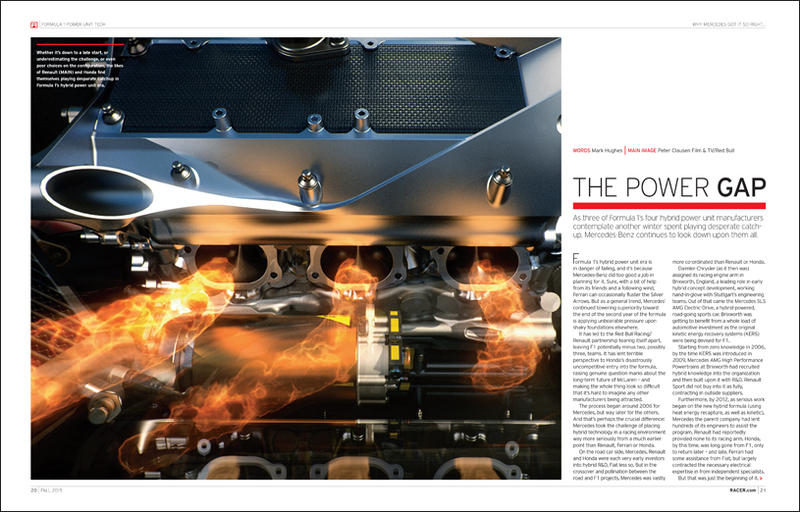 The technology itself is fascinating, and the attempt to return F1 to its rightful place as a tech leader is laudable. Plus, you can argue that there will always be winners and losers, so deal with it. But Formula 1 needs to work out where its priorities lie – the relevancy vs. entertainment conundrum – before grand prix racing becomes an ever-eroding afterthought on the sporting landscape. 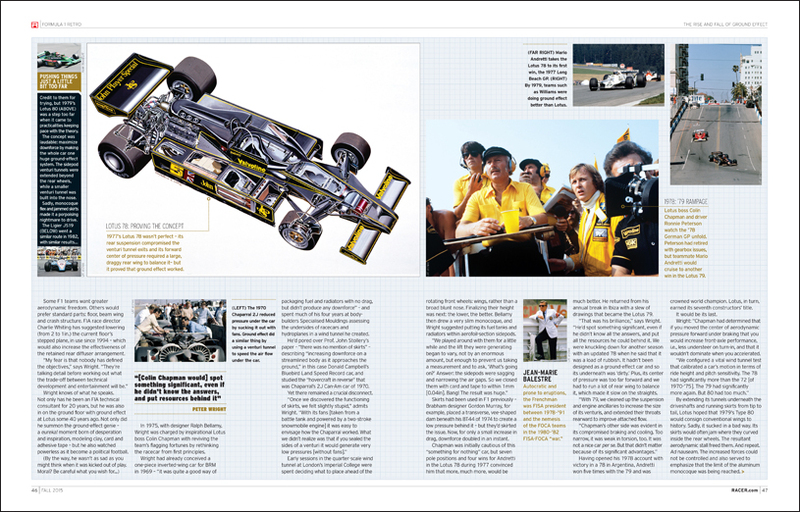 Elsewhere in RACER’s Technology Issue, Marshall Pruett gets the inside story on IndyCar’s “Year of the Aero Kit.” And, as F1 wrestles with its switch to hybrid power, we look at how the FIA World Endurance Championship is preparing for the first significant overhaul of its more flexible take on a similar theme.